Blinds Calculate Energy Savings with Window Shades. 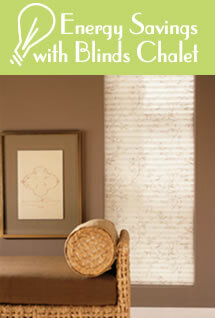 Calculate Energy Savings with Blinds Chalet Window Shades. View our Energy Efficient Shades. View our GreenGuard cerified blinds and shades. GreenGuard certification is granted by the GreenGuard Environmental Institute for products that meet acceptable standards for indoor air quality. Less fading of your interior furnishings. More consistent and comfortable inside temperature. On a typical home, windows account for nearly 50% of the heat gain or loss depending on the season, this in turn places close to 50% of the workload on your air conditioning system or heating system. That’s more than the roof, walls, and attic combined! Untreated windows will allow about 20 times more heat into your home than an equal amount of insulated wall space. By controlling the way the sun’s energy enters your home, you can save on summer energy bills and take advantage of “free” heating in the winter. When looking for energy saving blinds that will block out the hot sun, you’ll want to consider the “shading coefficient” of different alternatives. The Shading Coefficient is a measure of the ability of the window treatment to reduce the solar heat gain. The lower the number, the less solar heat will enter your home and the lower your cooling or heating bills will be. For instance, honeycomb cell shades and wood or faux wood energy saving blinds are better at energy conservation than roller shades or aluminum blinds. Keep in mind that interior window coverings such as honeycomb shades, wood blinds, and faux wood blinds reduce solar heat most effectively if the surface facing the glass is a reflective color like white. Use the simple form above to calculate how much energy you can save by adding window coverings or determine which type of energy saving window treatments are best for you.